The sparse crowd didn't appear to dampen the spirits of Margaret Burgess as she welcomed congregants to New Alpha Missionary Baptist Church on a Sunday in late August. "Praise the Lord, everybody," said the deaconess, who helps oversee church operations. "Praise God," 10 congregants intoned in response. It was a regular Sunday service for Vermont's oldest, and only, church that worships in the African American tradition. The windows and doors were open wide, admitting a cool breeze — and one curious reporter — into the sanctuary. The congregants found chairs inside the brick chapel beside the First Congregational Church in downtown Burlington, from which New Alpha rents space. Most of those in attendance said they'd been coming to New Alpha for years, even decades. "It's a very loving church, in spite of numbers — which I don't worry about," Burgess, a South Burlington resident, told Seven Days later. "I see growth, I see movement, but everything's on God's time." 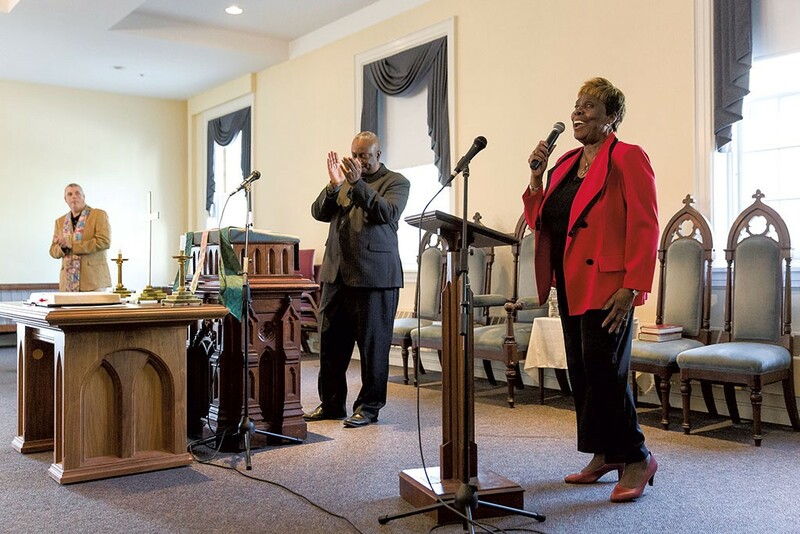 For 28 years, New Alpha has been a place of community and worship for Vermonters grounded in the black Baptist tradition of gospel music, emotive preaching and fervent prayer. The church, though, is in transition. Since last December, when longtime pastor Rev. Leroy Dixon retired, it's had no paid employees and membership has been declining. The New Alpha website redirects to a "currently inactive" message, and the Facebook page is rarely updated. On this particular Sunday, guest preacher Don Ray came from Plattsburgh, N.Y., where he pastors a black church, New Jerusalem Baptist. New Alpha is trying to resurrect itself. After a year off, members are planning its annual Gospel Fest, a community celebration of gospel music open to other churches and groups, for March 2018. They're forming a steering committee to hire a new pastor. The regulars navigating this time of uncertainty are clinging to their spiritual haven in the least religious, second-whitest state in the nation. According to 2016 census data, just 1.3 percent of the Vermont population identifies as black or African American alone. While 54 percent of adults in the Green Mountain State call themselves Christian, according to a study by the Pew Research Center of Religion and Public Life, less than 1 percent specify "historically black Protestant." "It's been a struggle to keep the doors of the church open for a lot of different reasons," said Burlington resident and longtime attendee Christine Kemp Longmore. "We're here for everyone, but we're here especially for African Americans and other people of color that feel like they need that connection to be part of this community." For now, those committed to the church give what they can in tithes and offerings. Regular volunteers, such as deacons Burgess and Jarvis Grant, run Monday Bible studies, organize Sunday worship, and find guest pastors. On the Sunday this reporter visited, Burgess had just returned from a vacation. She chose the hymns for the service just minutes before it started. After greeting attendees, she broke into the traditional gospel hymn "Just a Closer Walk With Thee," in a full, clear voice. Junior Selman joined in with a jazzy, upbeat electric guitar. "I am weak, but thou art strong, Jesus, keep me from all wrong," Burgess sang, as congregants swayed or clapped in time. "I'll be satisfied as long as I walk, let me walk, close to thee." New Alpha Missionary Baptist Church was founded in February 1989 by Rev. Rodney Patterson, who was then working as director of multicultural affairs at the University of Vermont. After he took the job, Patterson, an ordained Baptist minister from Michigan, searched for a place to worship and found nothing suitable. "I knew I couldn't come here without a church," Patterson told the New York Times in a 1989 article on New Alpha's genesis. "So I knew I would have to start one myself." That's what he did. 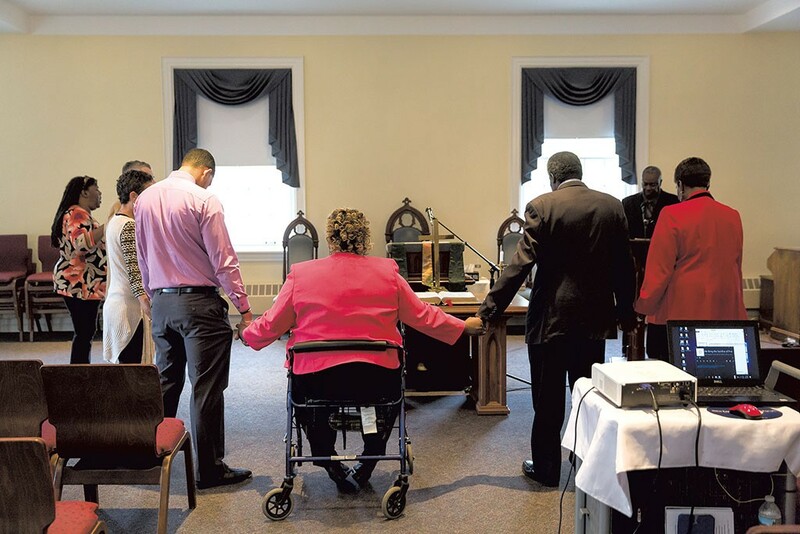 The church met in the Christ Church Presbyterian chapel on UVM's Redstone campus, explained Shirley Boyd-Hill, a Fairfax resident who said she was the first member of the choir there. She and her husband, Roy Hill, were recent transplants from Petersburg, Va.; Hill had a job fundraising at UVM. 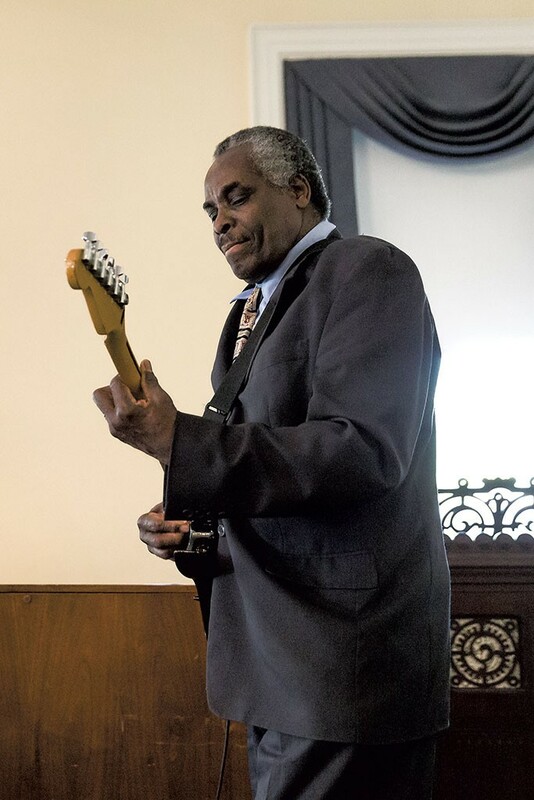 The couple and Patterson connected because in a place like Burlington, Boyd-Hill said, "black folk come together; we find each other." Within months, there were 50 attendees on any given Sunday. Eventually, a youth group and children's choir were established, and families met for a monthly potluck dinner, Boyd-Hill said. On Sunday afternoons, New Alpha members would visit patients in the hospital or the choir would sing in local nursing homes. "It was old-school; we were like family," Boyd-Hill said. Patterson left in 1994 for a job at Michigan State University. Two subsequent pastors led New Alpha for brief periods. The last time the church hired a pastor, in 2000, the process took nearly three years, according to church historical documents. In the end, the steering committee chose Leroy Dixon. Though he lived in Springfield, Mass., Dixon stayed on at New Alpha for 16 years, driving six hours round-trip to preach in Burlington each Sunday. When Dixon retired last December, the church faltered. Membership slipped, as did fundraising. Congregants found it difficult to make ends meet, despite relatively low monthly costs: less than $500 in rent, along with travel expenses for visiting pastors. Head deacon Grant wouldn't disclose New Alpha's finances but said it's sufficient. "We have funds available to do the work that the Lord has called us to do," he said. New Alpha isn't the only church struggling to attract adherents. The First Congregational Church, which has hosted New Alpha for most of its 28-year existence, has about 300 congregants — down from some 1,000 that once worshipped each week. "There's a huge number of un-churched people in the white and black communities," observed Rev. Carrie Bail, First Congregational's interim senior pastor. New Alpha occupies a niche among Vermont's observant black worshippers, Bail said. In fact, her church has been more successful than New Alpha in attracting members of Burlington's New American community, including a large group of Congolese. New Alpha's worship style "doesn't cross denominational boundaries very easily," Bail hypothesized. And when people do come to New Alpha, they don't always stick around, said Boyd-Hill. "Some people can stay here, and some people can't," Longmore said of blacks who move to Vermont. "They're so used to being in a more diverse community, it doesn't work for them." Longmore, who is biracial, was married in New Alpha soon after the church was founded. For Longmore, the church has become a place of solace. "Being people of color in Vermont, you can feel really isolated or you can feel like you don't belong," she said. Midway through the 90-minute Sunday service last month, attendance peaked at 16 — including the pastor and a reporter. Preaching from the Book of Samuel, pastor Don Ray explained there's a danger in going through religious rites without adhering to the voice of God. "God was speaking, but they did not hear it," he said of the young Samuel. Clad in black robes, he asked the congregation to repeat after him: "Speak, Lord. I want to hear what you wanna say." Longmore attended with her 25-year-old son, Wynston, who grew up in the church. New Alpha helped her children "form their identity" as black Americans in a largely homogeneous community, she said. After she divorced and became a single mother, Longmore added, the church offered her the support and encouragement she needed. But the church's lack of financial resources and committed members has taken its toll. Longmore lamented the lack of a youth ministry, saying there's just not enough "people power" to make it happen. Things are better than they were just after Dixon left, but finances remain tight, Longmore said. "We have to at least break even. If you have a pastor coming here from out of town, and you're paying his expenses, you have to be able to cover that," she said. A full-time local pastor will be costlier still, and finding one isn't easy. Other churches have tried — and failed — to draw clergy of color to the state, said Rev. Arnold Thomas, the pastor of the predominantly white Good Shepherd Lutheran Church in Jericho. He's the only full-time African American pastor in the state, and has occasionally spoken at New Alpha. In his previous capacity overseeing Vermont's United Church of Christ congregations, he had difficulty attracting black pastors to majority white churches and towns. "African Americans did not find enough churches within our state that reflected their faith tradition, their racial tradition, even in an integrated capacity," Thomas said. As for New Alpha, its presence "signifies there's still a strong enough critical mass of African Americans in Vermont to necessitate the establishment of a church with an emphasis on the African American worship tradition," Thomas said. "The challenge for New Alpha going forward is how it's going to acquire a pastor with an appreciation for that." There's reason to hope. Staff from the American Baptist region that covers Vermont and New Hampshire is overseeing the process, and there's been "a surprising amount of interest from visiting pastors," Longmore said. "The doors will never close," Burgess vowed. "Never." The original print version of this article was headlined "Resurrecting Faith"